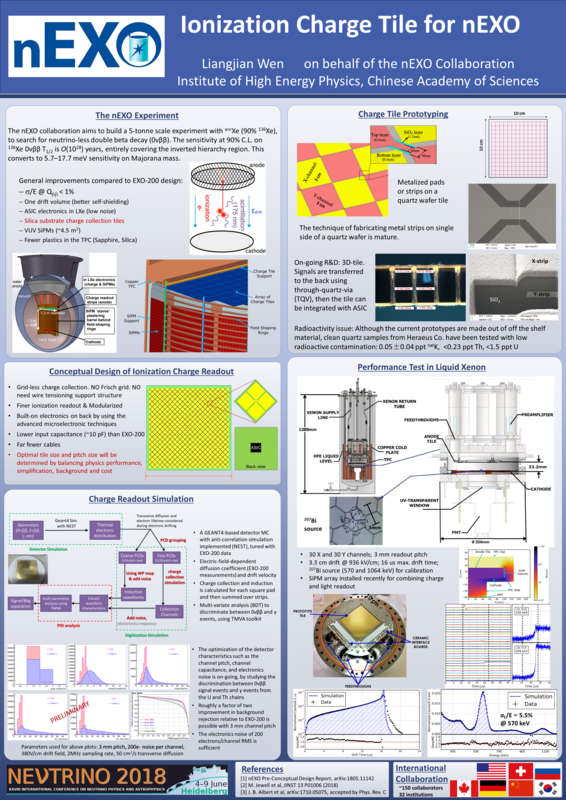 An ionization readout “tile” was investigated for use in the proposed nEXO experiment. The design is to deposit orthogonal metal charge-collection strips on a fused-silica wafer. The width of each strip is small compared to the size of the tile, so a Frisch grid is not required. This grid-less, modular design is beneficial for nEXO, where a wire tensioning support structure and Frisch grid might contribute radioactive backgrounds and need be designed to accommodate cycling to cryogenic temperatures. Prototypes were built and tested in liquid xenon. Very good agreement was achieved between the measured ionization spectrum of a Bi-207 source and simulations. The through quartz via technique allows to bring the charge from the front to the back of the wafer and integrate the ASIC electronics. Furthermore, it’s feasible to deposit grounding layer and embed ultra-low radioactivity capacitors to reduce the noise. The R&D status of the charge tile for nEXO will be presented.